We are in the midst of a February thaw. The backyard is a sea of mud and ice. This morning, four geese flew fast and low, soaring above the sugar maple. I wondered if they knew which direction they were going. I imagine it’s a confusing week for a goose. A few days ago the world was subzero, frozen solid in an arctic chill, and now a false spring has awoken birdsong and melted the ice into the aforementioned, ever present mud and muck. Beneath a slate grey sky, my children process through the mud with a blue umbrella and climb upon our chicken coop which stands six feet high, chickenless, strewn about with lumber and fencing. It will be finished this spring, my husband says. I grew up in the country and I live and raise my children in the city. I never imagined I would do this. When I was growing up and visited towns I pondered how it must feel to grow up hemmed in on every side by concrete and structures and people everywhere. I never really felt I could breathe until we hit city limits on the way out of town. At home, on the roof of our barn, I felt like I could fly. My mother grew up on a farm in Iowa where the green soybean fields of the former prairie roll out to an infinite horizon. She climbed high into the rafters of the barn and the cottonwood tree. She married my father and they settled on a small farm on a ridge in Wisconsin and she wanted to raise children who were free, and she did, nine of them. I live on a high ridge in the heart of a city. From our front porch you catch a glimpse of skyscrapers through the trees. Helicopters soar to the hospital on the hill above our home. I am trying to raise children in the city who feel rooted in the land and also free. I do not know how to do this. I do think that having chickens helps. In Pittsburgh, if you have a bit of a backyard, you can have five chickens or two mini goats. You can have a beehive. I am so grateful for that fact. The idea that you can live in the city but have your kids doing farm chores warms my heart. We used to have chickens, five of them, and hearing them clucking and scratching in the backyard and hauling hay in the back of the van felt like home. We had a small, stylish, well built coop. Unfortunately, the size of the coop made me feel sorry for the birds, who were trapped in such a small space, not free range at all, definitely caged in and totally miserable. This is where things went wrong. I felt sorry for my caged birds, and so I set them free. Sadly, I neglected to actually fence the backyard. I optimistically figured the hedge would contain them, which it did, briefly, but soon they had figured out how to squeeze through it and out into the alley, out onto the city streets. “A chicken is wandering Fisk Street!” I read on a neighborhood email, while deeply immersed in writing projects inside my home. My heart dropped, and I raced out to search for my chicken. This happened more times than I would like to admit. The cold sweat, heart pounding, public humiliation of searching for escaped livestock was actually a familiar one, for the farm I grew up on was somewhat short of fencing, and what fencing there was tended to be rather creative in nature. The children were free, and more often than not the pigs were too. A full grown pig is 7 feet long and weighs 700 lbs and can run surprisingly quickly. Pig chasing was the closest I got to athletics during my bookish childhood. When my chickens weren’t wandering the city streets, they were roosting on the back porch. They stared balefully through the window at me. Their soft clucks took on a sinister tone. One day, a chicken strolled into kitchen. Right about then, my husband decided it was time to take a break from raising chickens. Send them to your friend on the farm, he said. I’ll build you a real coop, with a fence. That was three years ago. We hope to finish the fence and get chickens this spring. The new coop has risen slowly, but it is sturdy and solid, strong enough for my children to climb upon the roof and gaze down the ridge, over the valley, across the river. Strong enough to feel like they could fly. This entry was posted in Farming, Kate, Pittsburgh and tagged Chickens, children, Farm, Farming, Neighbors, Urban Renewal, Writing on February 5, 2019 by sweetridgesisters. I’ve got a story for you. This story is the reason I haven’t been around this blog too much lately. It’s a great story, with glitz and glamor and historic preservation, along with a healthy dose of hope. At least I think so. A few weeks ago I was walking through the Bloomfield neighborhood just up the hill from my house on a beautiful day, hanging flyers for a Gala Bellydance Show. As I’ve mentioned before, I love hanging posters because it gives me a chance to stop in every shop and make discoveries about the world around me. As I hung my poster on the bulletin board at Starbucks, another flyer caught my eye. I pulled it down and headed back out into the street. I’m glad I did. The flyer was for a brand new studio space set to open at the end of October. 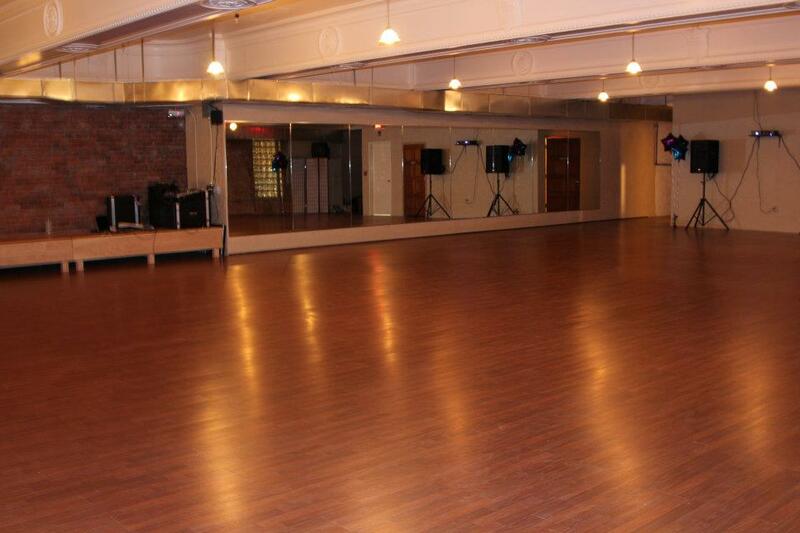 A studio space with 5000 square feet of floating dance floor, offering classes in ballroom, ballet, samba, salsa, modern, jazz, west coast swing, hip hop, and tap dance. This mystery studio had everything but bellydance. I was completely intrigued. I made my way home, keeping an eye out for a building in Bloomfield that had 5000 square feet for a dance floor. That evening, I called the number on the website for the Pittsburgh Dance Center and spent an hour on the phone with Holly. Holly Dayton-Kirby is the dynamic force behind the Pittsburgh Dance Center. 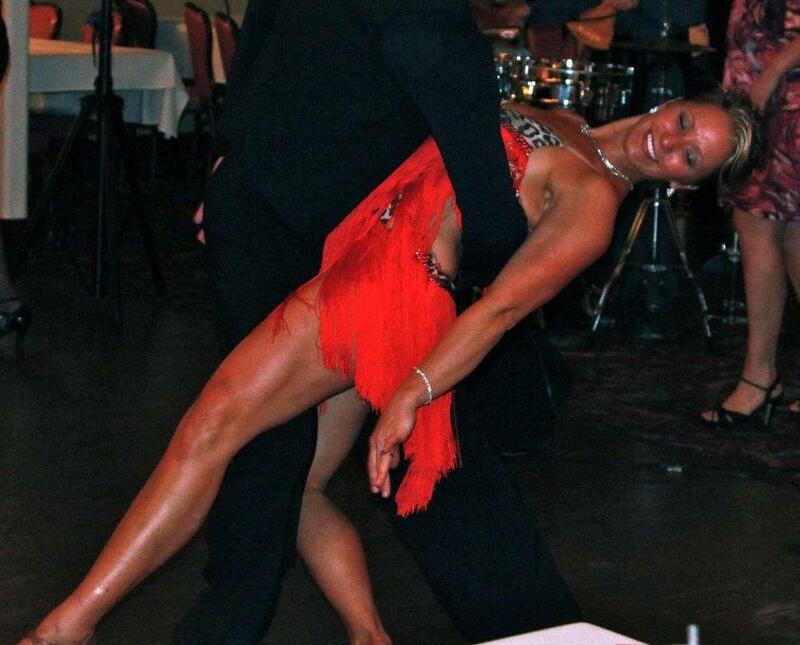 A professional ballroom dance teacher and instructor, Holly grew up in the Bloomfield neighborhood. She was raised by a single mother who struggled to make ends meet, let alone pay for dance classes. A couple crucial scholarships allowed her to become a professional dancer, performing with Dance Alloy in Pittsburgh and later as a part of the cast of Riverdance. Holly loves the neighborhood where she grew up. She also understands what it is like to be a kid who wants to dance and doesn’t have the money to afford it. She lives outside the city now, in the fancy suburban South Hills. 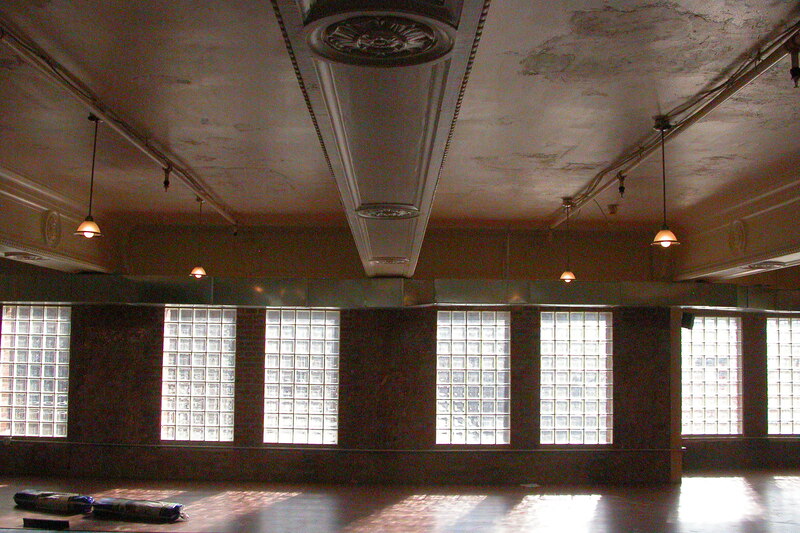 But when she decided to open her own dance studio, she put it right in the midst of Bloomfield. She said she wanted to give back the neighborhood- and that she would never turn a kid who turned up with toe shoes in hand, lacking the five dollars she is charging for every kids dance class. That’s right, I said five dollars. About the cost of one of those fancy grande lattes you can purchase in the Starbucks downstairs. 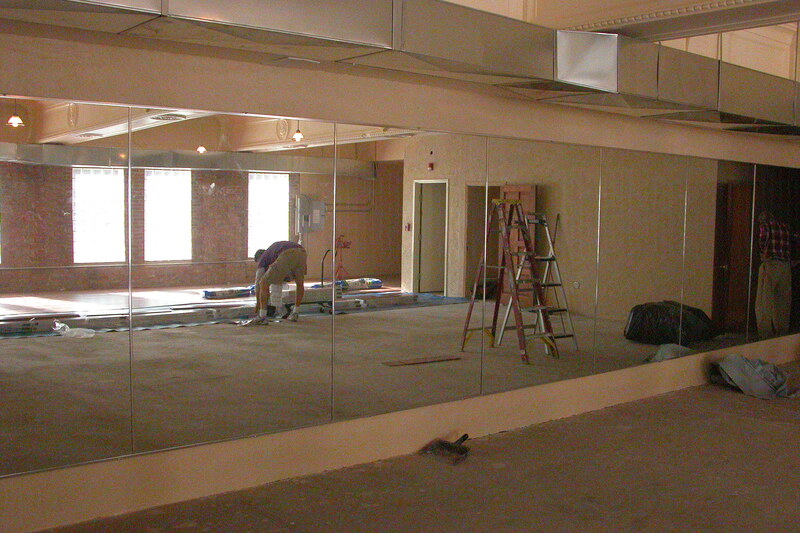 The 5000 square feet of studio space at the Pittsburgh Dance Center are located directly above the Starbucks in Bloomfield. 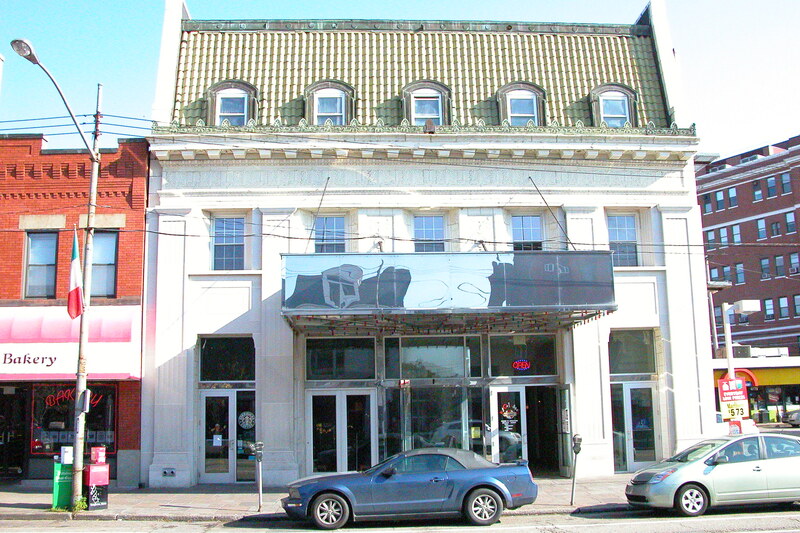 The building that houses the Starbucks and the dance studio used to be a movie palace called the Plaza Theater. 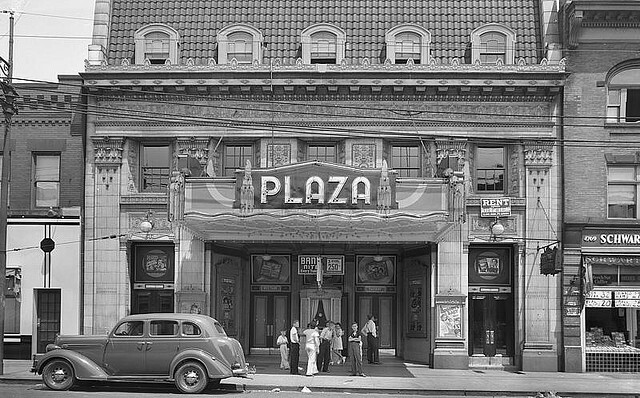 Here is the Plaza Theater in 1937. And here is the Plaza today. 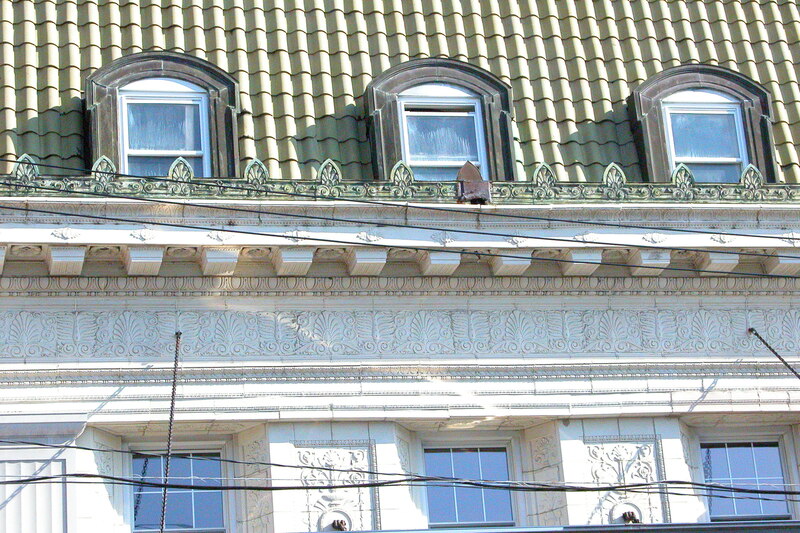 The glamor has faded a bit, but the detail on that building is still beautiful if you look closely. It is even more beautiful on the inside. The theater was converted into two floors. Starbucks is downstairs, next to a restaurant. 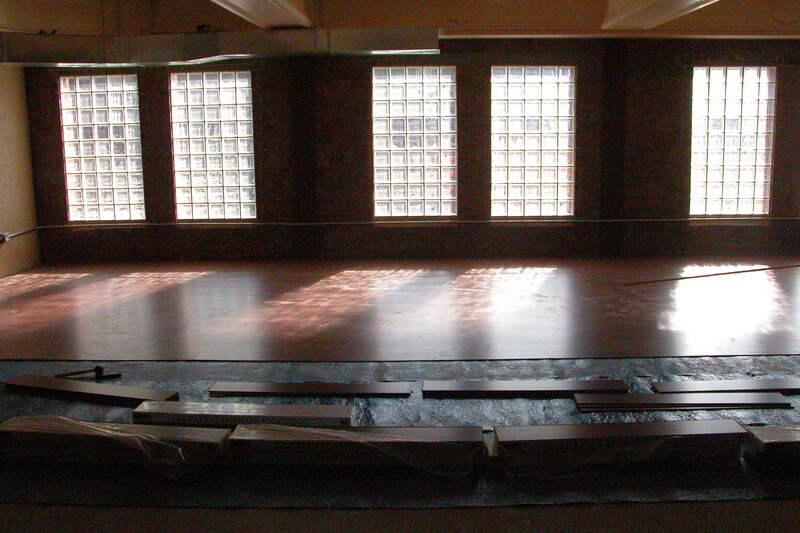 The second floor is where Holly put the dance studio. She took a blank space with a cement block floor and the ornate ceiling of the original movie palace and created a gorgeous warm and welcoming dance studio. It took a whole lot of work. I was privileged to get a glimpse of the tail end of that process. Holly, her husband, and their three kids were at the studio day and night in the week leading up to the grand opening. 5000 square feet is a lot of flooring to lay down. The studio opened on Halloween weekend. I was thrilled to perform on that dance floor for the opening, along with a great number of amazing dancers who will be teaching at the Pittsburgh Dance Center. I am teaching a class at the studio in a couple of hours- I’ll be there every Saturday at 3 for a bellydance class, if you are in the area and want to stop by. 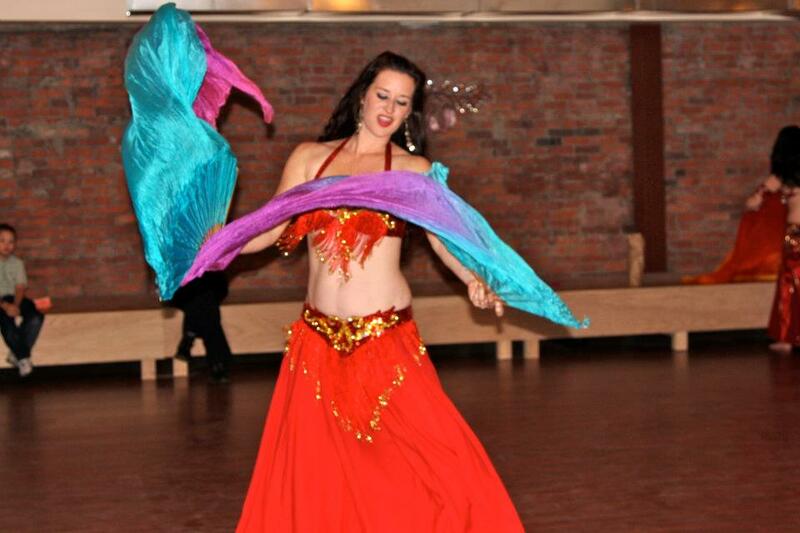 There is also a show tonight at the studio with local bellyrock band Ishtar- only five bucks, a bellydance lesson, special performances, and an open dance floor. Come on by if you are in the area! I am thrilled to be a part of this project. I love teaching at the PDC and I am excited to take classes with the other teachers at the studio. There is a complete schedule of classes available here. I think it is a great story of urban renewal, historic preservation, and hope. If you’re around, I hope you can be a part of it. Want to keep reading about my urban neighborhood adventures? This entry was posted in Kate and tagged Dance, Historic Preservation, Urban, Urban Renewal on November 12, 2011 by sweetridgesisters.